Find a niche that you truly love and you’ll find yourself in a great position. There is a caveat to this approach, though. They will probably find it harder to make money from creating products because their audience is so spread out. However, when you are getting over a million page views a month then creating a product might be at the bottom of your priority list. Now, this list isn’t going to make a lot of how to make money bloggers happy because they want to teach you how to take any blog to the moon. If they really wanted you to achieve their success then they would tell you to start a how to make money blog just like them. This is the obvious one. The real elephant in the room. Many beginning bloggers often find themselves asking if they need to start a blog on making money to make any money. It’s a great question because all of the blogs that teach you how to make money seem to be run by people that only make money through those types of blogs. …if you can show that you are making money yourself already. So does this mean that beginning bloggers can’t enter this niche? Of course not. Do you think if any of these bloggers had the chance to start over that they would choose another niche? This one can easily fall under how to make money depending on the approach a blog takes. Some personal finance sites teach you how to save money through frugal living while others show you how to make money with investing and side jobs. One of the larger bloggers in this space is Michelle Gardner. The majority of her income comes from her affiliate link with Bluehost (how to start a blog and make money) along with her affiliate marketing course. So both of those would fall under the first niche. The strategy here though is to cast a wide net around frugal living and then you show people that you can live frugally and make a ton of money at the same time. There are other sites in this niche that range from frugal living to investing. The Busy Budgeter by Rosemarie is another great example of one. Health and fitness is one of those tricky niches because you can get a ton of traffic from it, but it can be difficult to monetize if you don’t know what you are doing. Starting off the best approach to go is with affiliate marketing. This works well because your audience is actively searching for solutions to a problem and a nice Amazon (or wherever) link to a product that helped you can do wonders. A lot of blogs in this niche are usually run by teams of people or fitness trainers. Yes, you are reading that correctly. I might continue to add blogs to this niche due to the crossover potential it has with other niches. What do I mean? Well, Miss Fit Living can talk about dieting and yoga, while also talking about decorating your home and travel. The site is about living. This one is notoriously difficult to make money in because the audience isn’t really looking to buy things, they just want recipes. The best approach is to build up a large audience and use ads to supplement the business. Probably the most well-known blog that does this is Food Blogger Pro, that teaches bloggers how to start a food blog. This goes back to niche #1 and the strategy that I talked about before of starting a blog in a different niche and then teaching people how to duplicate that success on your how to make money blog. The problem though is that it is HARD. While the other niches rely on great written content, beauty and fashion are more reliant on your personality and your ability to continuously get yourself out there. Most of the big beauty and fashion bloggers focus on YouTube and Instagram because they are visual platforms. Once they build a following there they slowly build out their blogs. 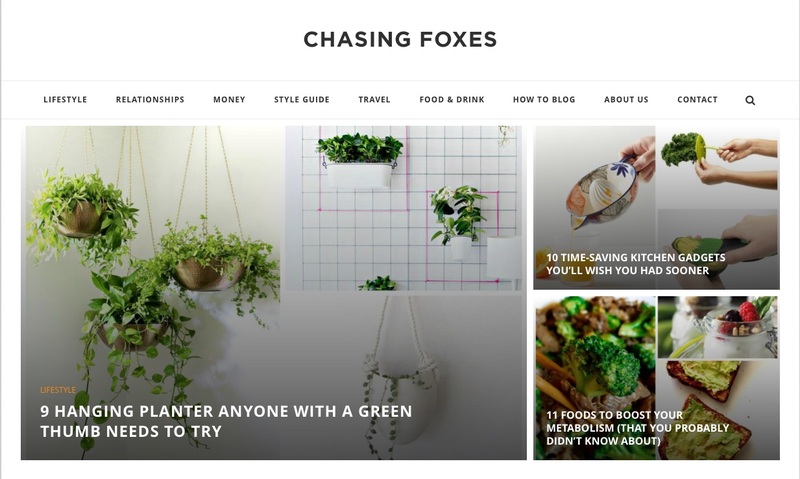 Unsurprisingly, their blogs become more lifestyle blogs that cover a number of different categories beyond fashion and beauty. Why? Because the beauty and fashion niche is all about an overall lifestyle that you live. This one is the hardest to describe because it is so broad. Some bloggers take this niche to the extreme and think they can write about anything that involves their life but that isn’t the case. These are not all of them but these are definitely ones that I would consider creating a blog in. Monetization methods for this niche are usually ads or printable. With the first 3 sub-niches books can work really well. You’ll notice that some of my blogs repeat in this niche and in others. The reason why is because the Lifestyle niche has a lot of crossover to it. Okay, so here’s the thing about the lifestyle niche. Most people screw up big time in it because they really believe they can just write about anything. To succeed in the lifestyle niche you have to either be solving a problem that a lot of people have (how to organize your home) or you need to write about a topic that people are irrationally passionate about (bullet journals). There is no in-between if you want to see success early on. You can point me to examples of bloggers that succeed in this niche that seem to talk about their lives but usually, those bloggers have been around for a while. To gain traction you either need to solve problems or write about irrationally passionate topics. Just like a lifestyle blog a personal development blog can be tough because many people don’t target a specific problem. They create a blog that is vague on its purpose beyond living a better life. I promise to help you kick your procrastination habit. I will help you overcome your depression. Simply offering a better life doesn’t help out anyone unless you are specific about how you are going to help. As you know there are a ton of ways to make money blogging and not all of them apply to all of these niches. By default, you can assume advertising works for all of them, but advertising is not the most lucrative way to make money. Selling your own higher-end products is where you really start to see returns but it’s hard to justify paying for a course on closet organization. That’s why you see many popular bloggers outside of the how to make money niches create products that fall under the how to make money niche. There is nothing wrong with this approach and it works very well because you are already establishing authority with your audience. Many people that visit your blog will think that they want to start a blog just like that and that’s when you offer them your book/course on blogging. Of course, with so many infoproducts like this already out there you best make sure yours is pretty good. Your whole audience won’t know what else is out there but that doesn’t mean they won’t expect great results. That’s why I’ve waited for so long before finally announcing the Billionaire Blog Club. I wanted to make sure that I understood what it takes to build successful blogs across a number of different niches before putting these concepts into a single course. I now make money selling digital products, membership communities, affiliate marketing, and ads (although these are always just a temporary measure). How much? Well you can check out one of my income reports to see. If you’re interested in finally turning your blog into a business by following actionable videos then check out the Billionaire Blog Club. And of course, if you feel I’m missing a niche or know of great examples of blogs that I missed in the niches below please let me know in the comments. You don’t get what you don’t ask for so I’m asking you to take a second to share 7 Blog Niches That Get Good Traffic and Make Good Money with your audience. They respect great content.